568 pages | 97 B/W Illus. With the use of high-level soil management technology, Africa could feed several billion people, yet food production has generally stagnated since the 1960s. No matter how powerful the seed technology, the seedling emerging from it can flourish only in a healthy soil. Accordingly, crop yields in Africa, South Asia, and the Caribbean could be doubled or tripled through adoption of technologies based on laws of sustainable soil management. Principles of Sustainable Soil Management in Agroecosystems describes the application of these laws to enhance ecosystem services while restoring degraded soils and promoting sustainable use. 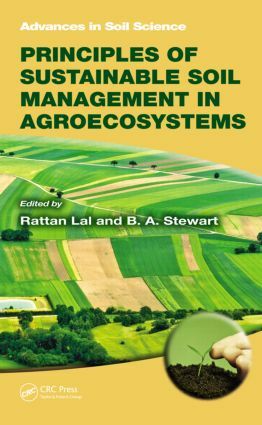 With chapters contributed by world-class soil scientists, ecologists, and social scientists, this book outlines critical changes in management of agricultural soils necessary to achieve food security and meet the food demands of the present and projected future population. These changes include conversion to no-till and conservation agriculture; adoption of strategies of integrated nutrient management, water harvesting, and use of drip sub-irrigation; complex cropping/farming systems such as cover cropping and agroforestry; and use of nano-enhanced fertilizers. The book is based on the premise that it is not possible to extract more from a soil than what is put into it without degrading its quality. The strategy is to replace what is removed, respond wisely to what is changed, and be pro-active to what may happen because of natural and anthropogenic perturbations. The chapters, which exemplify these ideas, cover a range of topics including organic farming, soil fertility, crop-symbiotic soil microbiota, human-driven soil degradation, soil degradation and restoration, carbon sink capacity of soils, soil renewal and sustainability, and the marginality principle. "This book makes the case for sustainable soil management as an essential prerequisite to securing global food supply. … The strength of the book lies in the wide array of topics presented from diverse viewpoints. … Overall, the book is an engaging and stimulating read. It effectively makes the case for the necessity of including soils as the central focus of all efforts to feed a growing world population in a sustainable manner in the face of a changing climate. Summing Up: Recommended. Upper-division undergraduates and above." Rattan Lal is a distinguished university professor of soil physics in the School of Environment and Natural Resources and the director of the Carbon Management and Sequestration Center, Food, Agricultural, and Environmental Sciences/Ohio Agriculture Research and Development Center, at the Ohio State University. Previously, he was a soil physicist for 18 years at the International Institute of Tropical Agriculture, Ibadan, Nigeria. Professor Lal conducted long-term experiments on topics including land use, watershed management, soil properties, soil tillage and crop-residue management, and cropping systems. He has continued research on erosion-induced changes in soil quality and developed a new project on soils and climate change. He has demonstrated that accelerated soil erosion is a major factor affecting emission of carbon from the soil to the atmosphere. B.A. Stewart is a distinguished professor of soil science at the West Texas A&M University, Canyon, Texas. He is also the director of the Dryland Agriculture Institute and a former director of the US Department of Agriculture (USDA) Conservation and Production Laboratory at Bushland, Texas; a past president of the Soil Science Society of America; and a member of the 1990–1993 Committee on Long- Range Soil and Water Policy, National Research Council, National Academy of Sciences. He is a fellow of the Soil Science Society of America, American Society of Agronomy, and Soil and Water Conservation Society and a recipient of the USDA Superior Service Award and the Hugh Hammond Bennett Award of the Soil and Water Conservation Society.